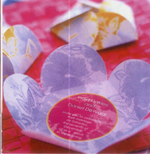 Tropical Wedding Theme - Creating your own "Club Tropicana"
Set the tone from the very beginning with these hand made tropical wedding invitations! These beach wedding invitations will be cheap to make yourself, but will look anything but! Buy the paper at your local craft shop or simply print your own on your home computer. The bright colours and casual wording will inform your guests that fun will be the order of the day. Why not start the fun at your tropical beach wedding ceremony! Bamboo sticks decorated with palm branches, bright flowers and flowing fabrics. Create a wedding arch with two or more palm branches. This will provide the perfect backdrop. Have your bridesmaids hand out small wooden bowls or coconut shells filled with grated coconut for your guests to strew over you as walk back down the isle. Chilled dinky glass bottles with a wicked tropical cocktail (and a plastic goldfish – for fun) make for brilliant welcome drinks either on the beach after the ceremony or when your guests arrive at the reception. Find some glass juice bottles with twist-off lids. Cover the lids with foil, add a plastic fish in each bottle (available from most toy stores)and top with cocktail mixture – click here for recipe. Close the bottles and decorate by tying a straw to each bottle with some colored raffia or ribbon. Chill and serve! These cheerfully colored umbrellas sporting seating assignments are displayed on miniature sand dunes at the entrance to your reception. For your tropical wedding favours, buy some really outrageous tropical silk flowers from a discount store. Buy ball point pens and some florist’s ribbon. Remove the stopper from the pen and cut or remove the stem from the flower. Glue the flower onto the end of the pen and allow to set. When it has set, wind the florist’s ribbon around the pen and add the name tag of each guest. Garland yourself and your wedding party with delicate leis. Hang flowers and feathers from the ceiling with coloured ribbon along with waves of sheer fabric to create a floating watery effect. Use white table cloths and decorate the table with tropical flowers and tealight candles in coloured glass holders. Decorate your bar with a surfboard, frozen vodka, and of course a good looking barman dressed only in boardshorts and a floral lei! 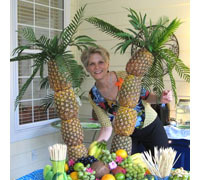 For an eyecatching buffet centerpiece, why not try this unique tropical fruit display. This is apparently very easy to create and can be done the day before the wedding. Once the fruit is cut, this entire display can be assembled in under 15 minutes. This is sure to be a hit! Click here to download instructions. Your cake will double as your dessert, so go for something exciting like this four-tiered white chocolate and strawberry mousse cake. Ask your florist to decorate with a few tropical flowers for a cake to truly suit your tropical wedding theme! Just keep in mind that the chocolate is very heat sensitive, so keep it in a cool and shady area of the reception till you are ready to cut it. Entrance: Club Tropicana – Wham! For some more ideas on creating an island or tropical wedding theme try the My Island Party Ebook. This is an ebook dedicated on how to organize a complete tropical island theme party with an authentic Polynesian feast and ambience with recipes, desserts, drinks and decorating ideas. Follow this link from Tropical Wedding Theme to the Beach Wedding Themes Page for other themed ideas.